SERVPRO of Plano is locally owned and operated and has been helping customers like you for over 25 years. 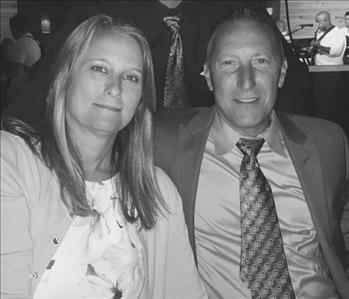 Our owners, John and Kim Beres take great pride in making sure our customers receive the best customer service possible from our team members. No job is too big or too small for SERVPRO of Plano to handle. From the small toilet overflow in your home to the large sprinkler pipe break in your business SERVPRO of Plano is there to help you 24 hours a day 7 days a week 365 days a year. SERVPRO of Plano understands the stress and worry that comes with a fire or water damage and the disruption it causes to your home or business. Our goal is to help minimize the interruption to your life and quickly make it "Like it never even happened." SERVPRO of Plano specializes in the cleanup and restoration of residential and commercial property after a fire, smoke or water damage. From initial and ongoing training our technicians are IICRC and ECTP certified to handle all your restoration needs. SERVPRO of Plano is also certified to handle bio-hazard, crime scene, hoarding and trauma scene clean up. Our highly trained team members of SERVPRO of Plano are odor removal experts. Whether from cigarette odor, skunk odor, something you accidentally left cooking on the stove, or a major commercial fire odors are no match for the experts at SERVPRO of Plano. With the most advanced technology and equipment available, it allows our employees to provide you with the peace of mind knowing that your restoration was handled by the professionals at SERVPRO of Plano. Even though our team has grown this past 25 years our mission has never changed. You, the customer, are our number 1 priority! Backed by a nationwide system of more than 1,700 qualified franchises, no damage is too large or too small for SERVPRO of Plano. If you would like to schedule service for your home or business, please call today! We would be honored to handle your cleaning and restoration needs.